Dr. Vijay H. Vaishnav is an Asst. Professor in Materia Medica at the University of Bombay. He has been a full-time faculty member honorary physician at Smt. CMP Homoeopathic Medical College, Bombay, India, for almost 19 years. He has been closely associated in developing new concepts in teaching Materia Medica and has prepared a unique model of approach to the study of Homoeopathic Therapeutics. He and lectured at Hahnemann College of Homoeopathy in the UK, and conducted informational seminars in the USA,Vienna,Austria . He shares his evidence-based experience with a case of deep vein thrombosis. I was called on July 16, 1997 to see a 34 years old male patient who was admitted at a leading private hospital in Bombay for the treatment of deep vein thrombosis of his left leg. The problem had apparently begun in May 1995 when he developed pain and redness of the left calf region. This had gradually worsened even though he was being treated with anti-coagulants and had reached a point where he had severe pain in the Lt. thigh that soon spread all the way down to his foot. He therefore was admitted and had an urgent Angioplasty on July 13, 1997. When I visited him in the hospital, he was in great pain, esp. around the lt. ankle. He felt a burning pain, like sparks of fire < walking, overexertion > pressure (of stocking) There was a swelling around the ankle. 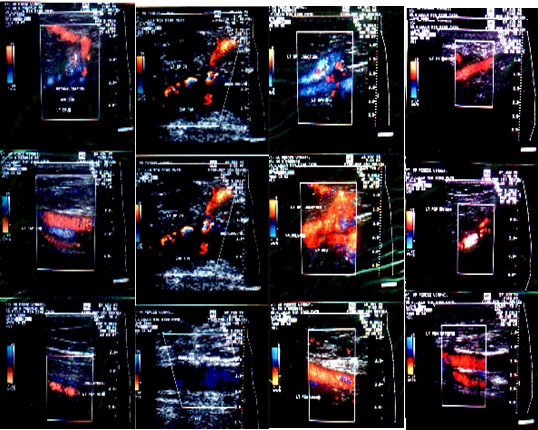 The Color Doppler studies done post-operatively on July 14 showed DVT of the Lt. external iliac, posterior tibial and other veins of the lt. lower limb. On the basis of the inflammation of the veins with thrombosis and the history of trauma (angioplasty) the drug selected for him was Hamamelis (the Aconite of the veins). This was given in the 30C potency q.i.d. initially and later the potency was increased to 200C. fresh Color Doppler that showed a residual thrombus in the veins with a few recanalised flow channels. These symptoms were < evening, 1st motion and were > lying down, hot fomentation, massage, continued motion. He also had a pain in the lt. shoulder occurring at least once a month. This was associated with cramps in the lt. side of the neck, which would then appear to be swollen. The movements of the shoulder were painful and restricted and were < night, initial motion and > heat and continued motion. He was a chronic smoker and also chewed tobacco. His business required him to entertain clients in his office and so he had at least 8-10 cups of tea every day. His appetite was good and he would be irritable if he did not eat on time. He craved sweets, cold milk and fried food. His thirst, bowel movements and urination were normal. The tongue was clean but fissured. He often had a cold sweat on his palms. He described himself as a happy go lucky person and was generally a mild person. However, since his hospitalization, he had become irritable, esp. From noise. He would shout and scream from anger. He had a good memory and a very good confidence in his abilities. Lately, however, he felt a bit worried about the future. He wondered if his illness would come in the way of his capacity to earn a living. He had a fear that if the disease reached a point where he would need to be operated again or was bed ridden, he would lose all his business and would soon be a very poor man. Treatment: Considering the underlying miasm; the location- veins and joints; the pathology- thrombosis in the veins and degenerative arthropathy; the mind- fear of poverty, and certain signs like the fissured tongue and past history of severe bleeding piles the drug Calcarea fluorica was selected for this patient. It was given in the 200C potency, 3 times a day for 1 week on July 30, 1997. NO pain and swelling on the foot. The patient was then asked to follow-up once a month to monitor his progress. He was not given any medicine (nor placebo) during this period and the Color Doppler showed resolution of the thrombus and recanalisation of the veins. 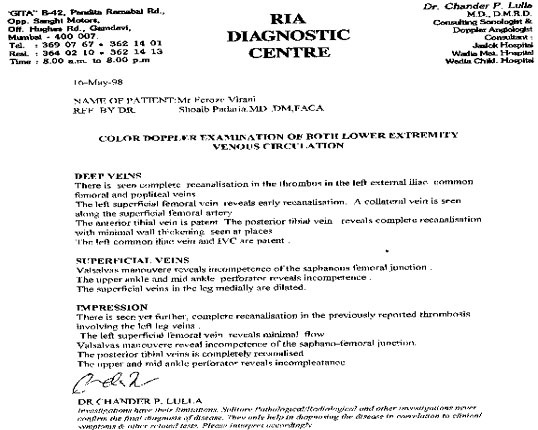 The Doppler studies of May 1998 showed complete recanalisation of the leg veins.